It’s Easy to be Vegan! I can say “It’s Easy to be Vegan.” because I have helped many people become vegan and change their lives!!! And you can do it too! I have the road map for you to follow. Read on to see what makes this so easy that people have repeated it a few times over. Literally, just follow my Full Body 30 Day Vegan Cleanse program and it teaches you how to be vegan. It is a step-by-step guide. It is important to me that when you have completed Full Body 30 Day Vegan Cleanse that you feel and see the differences to your health. It is also very important that by doing this Cleanse, you will know that you can eat healthfully, cooking very healthy foods for you and your family. The time you spend doing Full Body 30 Day Vegan Cleanse gives you the experience. Experience is very valuable because once you have an experience, who you are, what you are capable of is better than who you were before. You will learn that it is easy to be vegan and you Are capable of being vegan. A plan. Having a plan makes it Very easy to be vegan! Taking on big changes can be difficult, but not if you have a plan. By having a plan you can just apply yourself to forging forward onto this new path. Don’t waste any time trying to figure out your meal plans, it is already done for you. Every meal for each day with full recipes. Along with every snack, smoothies, vegetable juices, salad dressings, even time-saving tips. Full Body 30 Day Vegan Cleanse is literally a day-to-day guide. This is another reason why the people who have already done this Cleanse have loved it. If you want to be truly healthy. If you want to raise your family to be truly healthy. If you want to enjoy life because you are healthy and don’t have to be concerned about your health, your husbands health and the health of your kids- then this is the Cleanse for you! As soon as you decide you are ready! This is on your schedule. You can take this on whenever you want to. Also, it becomes easier to be vegan every day you eat vegan. It’s like any other habit that has become a part of your life. Every day you eat vegan, you understand, by doing it, that it really is do-able, and it is easy to be vegan. And, every day you eat vegan you feel better which is great reinforcement that you are making Very beneficial changes to your body that will serve you in the long run. The process of this program teaches you everyday how you can take great care of yourself and your family. Once you have completed the 30 days, you will realize that you can continue in this manner. The next question you may be asking yourself is, “How do I become vegan?”. It’s just going to take some learning, like anything new you want to do in your life. 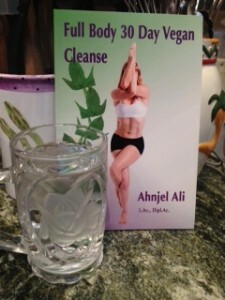 Full Body 30 Day Vegan Cleanse is literally a day-to-day guide making it very easy to learn to be a Vegan. 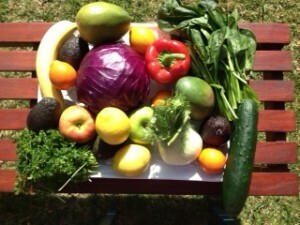 There is great information on the website Full Body 30 Day Vegan Cleanse . I have also written a blog on How to be a Vegan which you might find useful. Why would you want healthy eating habits? If you live in the United States why should you take the time to eat healthfully when it is much more convenient to eat fast food? Why would you care about eating healthfully if you have insurance and your bills will be covered anyway? Why should you eat healthfully when there are prescription medications for almost anything that could go wrong with your body? Is your life made easier just because you eat healthfully? Could your life be better just from being healthy? If you live in the United States, (I am referring to just life in America because that is what I know), there is a really good chance you have a very packed schedule. It’s a funny one to think about but, did fast food become the billion dollar industry it is because we started filling our schedules so much? Or, did we begin filling our schedules so much because we didn’t have to be home preparing our meals? This is a good question to ponder. Okay, so, with an abundance of fast food establishments all across America, why should you bother taking the time to prepare your own meals when it is so much more convenient to grab food on the go? If it doesn’t matter to you if you get three times as many calories from one fast food meal then a meal you would most likely cook at home. Most fast food meals are packed with almost as many calories as a person should be eating for the entire day. If it doesn’t matter to you that you will get 33-74 grams of fat in one fast food meal? Which is about as much fat as any person should take in in 1 day. Also, the fat calories from fast food are usually from trans-fats and saturated fats and have negative effects to your liver, your heart, and your blood. These are not the healthy fats that our body needs. Why would you care about eating healthfully if you have insurance and your bills will be covered anyway? You pay for insurance, why shouldn’t you just tap into it and let your insurance company cover your medical expenses? Okay, that’s one way to think about it. But, realize that in the last few decades insurance companies have been paying out trillions of dollars. The increases in how much the insurance companies are paying for their insured has multiplied in the last few decades. This matters because it is these astronomical costs that are of course passed on to all of us. This is the reason we all pay an increasing amount to be insured. Over the last 6 decades, the health of Americans has steadily declined. With that, of course, the medical costs increased. It is not coincidental. Why should you eat healthfully when there are prescription medications for almost anything that could go wrong with your body? Even if you are 70 years old, “popping a pill” is taken very casually. Any person younger than 70 has been growing up in an environment that sees prescription medications daily, which allows most people to feel comfortable with them just because of their lifetime of exposure. Some of the exposure is by seeing friends and family members taking medications. Think about the kids now that are growing up seeing medications advertised on television…It is that exposure that breaks down barriers of trust and the thought of harm. Many people don’t have the slightest hesitation about taking a prescription medication. The thought is, “Prescription medications have been around for decades now, they can’t be hurting anyone, right?” This is where what you don’t know can hurt you, even on the FDA website you can look and see the “Adverse Events Reporting” statistics. Here is the range, in 2004 there were 34,739 accidental deaths from prescription medications, and there were 198,828 serious outcomes. Fast forward to 2013, on the FDA website, there were 117,752 accidental deaths and 711,232 serious outcomes. The better question then is, should you have healthy eating habits and take care of yourself now or just rely on pharmaceutical medications when you will need them? Could Total Body Health Make Your Life Easier? In many ways, yes. If you were healthy, if you had healthy eating habits, it could be easier to get up in the morning. If you were healthy, even your sleep could be better. If you were healthy, it would feel great to be able to go out for a walk or bike ride. It would be easier to do even the tasks and errands that you have to do if you feel good. Every aspect of your life filters through your brain with how you are feeling. If you feel good, everything you have to do is made that much easier. This is usually a point that goes unnoticed by many people, but it makes a crucial difference to your life. Could your Life be Better Just From Being Healthy? I think so. By being healthy and having healthy eating habits you have more time for fun if you don’t have to go to many doctors appointments. If you are healthy, you will feel good and that means you will most likely be able to enjoy your life. Your brain is impacted by your health, if you are healthy your perspective would be different because there is a difference in the neurotransmitters and hormones produced in a healthy body than the neurotransmitters and hormones that are produced in an unhealthy body. Everyone can have healthy eating habits. If you want to learn how to develop truly great eating habits that you and your family can stick to, take a look at Full Body 30 Day Vegan Cleanse. The sustainable eating plan that can change your life for the better! How to be Vegan is a common question. For most people it requires many big changes. Getting some help would make a big difference in easily becoming vegan. There are 2 very important tips to becoming a vegan here in this post. The number one tip to being vegan is have a plan. How to be a vegan can be easy if you have a plan. If this is a new lifestyle for you, you have a much greater chance to succeed if you have a plan, a blue print to being vegan. Planning meals is one of the biggest deterrents for many people who think they want to become vegan. Even if you have been vegetarian for a while, a plan going into being a vegan can be the one factor that can help you to be successful. The next step to becoming vegan is cutting out all foods from your diet that are from an animal. This of course means taking all meat out of your diet, all chicken, turkey, pork, eggs, milk and all dairy products and honey too, since it comes from bees. This is the easy step, the taking out. Being vegan then really hinges on what foods you can eat. My personal choice is to eat healthy foods and meals. Not to eat vegan foods that are unhealthy foods, (that will be a separate blog post), but my choice is to be healthy for life. This is where it becomes exciting because it will open up a whole world to you that can change your life for the better. The foods you will be eating as a vegan are vegetables, fruits, beans, nuts and grains. The trick to successfully being vegan is in eating foods that you will enjoy. That is the important second tip to being vegan successfully. Being vegan does not mean you will be eating rabbit food. This was actually one of my intentions upon creating Full Body 30 Day Vegan Cleanse, to create a blue print for being vegan with truly great tasting and satisfying meals for 30 days. There are many different vegetables to eat, this is your opportunity to try some vegetables that you may have never tried before. As an example, kale sprouts are relatively new and they are yummy! Kale sprouts are a combination of kale and Brussels sprouts. There are number of ways to prepare them and they pack a great dose of needed nutrients. Nuts and seeds are a great source for protein as well as healthy fats. We all need healthy fats. And while seeds and nuts are great as snacks, they could be so much more than that! You can use seeds and nuts in breakfasts, lunches and dinners. It is easy when you know how, and have direction for how to incorporate them into a vegan diet. Trying to have a diet without fats is very hard because your body will be yearning for fats, you will be feeling like something is “missing”. This is the sustainable vegan cleanse because you will be giving your body foods it truly needs. You can live and stay healthy for life by eating this way. Planning meals is one of the biggest deterrents for many people who are considering becoming vegan. You may love being vegan when you learn how to be vegan right. And you will love being vegan when you love the foods you eat! Being able to follow a plan is one of the favorite things people who have done the 30 Day Vegan Cleanse talk about. 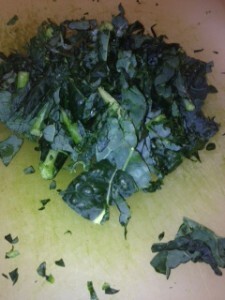 My Vegan Cleanse is a blue-print for becoming a vegan. You can learn to be healthy for life maintaining a vegan diet. Eating vegan and feeling great – this could be you! 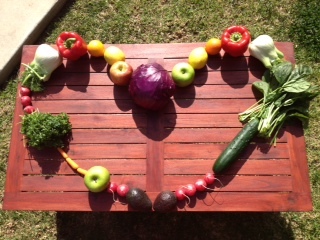 Ask yourself,” Do I love how I feel everyday?” You will by eating vegan! By eating vegan you can wake up feeling great everyday! I love how I feel when I wake up. And you can feel just this fantastic throughout the whole day! I know you can because this is how my lifestyle allows me to feel and everyone who has done Full Body 30 Day Vegan Cleanse feels just this great! I love how I feel through the day. I love how I feel after a demanding workout. And I love how I feel after drinking one of those deeply satisfying green vegetable juices I make.You will feel the same way – most of us who have done the Full Body 30 Day Vegan Cleanse crave the green vegetable juices listed in the book. I love how I feel after I eat the very healthy lunch I made. All the vegan foods my boys eat has made them very healthy young men. And it shows in all their athletics. Thanks to eating vegan meals and foods, my husbands health is not a source of concern. He is incredibly healthy. That is a huge source of security. I know many women who fear for their husbands health as they get older because for years they haven’t taken care of themselves. Eating vegan, you will make great choices for your family that will make a difference now and very importantly, for the years to come. I love the choices I have made for myself and especially for my family. This is my life-long commitment and it is worth the time I put into it. I truly love every day in my office when I get to help people get healthy! The reason I love being able to help people get healthy is because I know they will enjoy their life so much more! It is now a few weeks past January 1st, and it may be time to re-think again about the New Years resolution you made for yourself. Think about why you wanted to bring about those changes into your life. Remember the end result you wanted from that resolution. It gets tough for the majority of people even by the end of January to stick with their resolution. This is evidenced in the statistic that by the end of January, the majority of people with New Years resolutions have already given up on them. That is a shame. This is the perfect time to think about how you can make this resolution manifest for your life. You may have to dig down a little bit more and realize the changes you need to bring into your life. You may need to talk to your supportive friends and family members and engage their help. You made need a plan. If you need help with a plan so you can accomplish your New Years resolution to be healthy, this is your plan to success! Every day for 30 days, is completely laid out for you to follow. It is easy to follow. The recipes are not complicated, but are all very good! To be successful always requires a plan. This is a great plan! All plans have steps to them, to be done in a specific order to ensure success. Your New Years resolution will require steps to be taken to be successful. The first step is the thought, the thought that there is a change you want to make. Most likely, this has been a thought you have had several times. For most people, their New Years resolution comes about after they have thought about the matter for a period of time. It is a big enough issue driving millions of people to make a decision that going forward from January 1, they strongly desire to make that change. Step 1: Be clear on your New Years resolution. Step 4: Have a plan in place that will allow you to be successful at your New Years resolution. The very delicious kale salad I made only came about because all of the above steps were followed.Step 1) I had an idea, the kale salad. Step 2) I took action, I bought the kale and all the other ingredients I wanted in the salad. 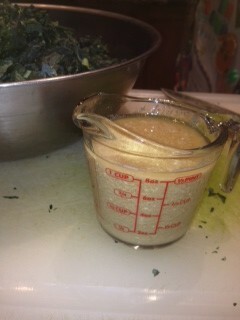 Step 3) I committed to making the salad and the dressing for it. Step 4) I had a plan in order to create this delicious salad for my family to keep them healthy! Step 3: Commit to your New Years resolution. Commit to your resolution.You have thought about it, you have wanted the changes, now commit to make those changes. To ensure your success, have a plan, and have support. Support in terms of friends or family that will support you in wanting these positive changes. If you have people around you that will not be supportive while you make these changes, please minimize your time with them. Or maybe, you have friends or family in your life that will make these same changes in their own life and you can bring about these changes together. I know that there have been groups of people that have done Full Body 30 Day Vegan Cleanse together. They loved the experience and loved being able to go through it with friends. Commit to yourself. Most all New Years resolutions are for positive changes people want to bring into their life, realize that you are worth the time, the effort and the learning that may be required for you to make these changes. Commit to yourself. On the other side, once you have made the changes you want in your life, there is a better you! Step 4: Make a plan. This post to be continued. 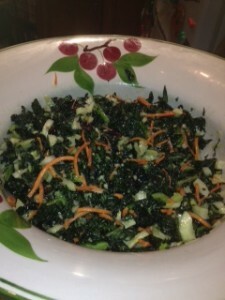 The yummy kale salad I made only came about because I had a thought, I took action, I committed to that thought of what I wanted, and then I had a plan. As you may have read in yesterdays post, almost 40% of Americans make New Years resolutions, being millions of people. Out of that 40%, 38% are resolutions to loose weight. Even better than just loosing weight though is learning to be healthy. Because if you learn that- you have the knowledge to stay healthy for the rest of your life! Even better than that – you can raise your family healthy! Full Body 30 Day Vegan Cleanse teaches you how to do that! Take action toward this new direction you want in your life. All New Years resolutions are for positive changes. People have very good intentions. And, people sincerely want to benefit from the positive resolutions that they had desired. This leads then into what is required next, and that is action. A resolution is a thought, to achieve results, taking physical steps toward the resolution will begin to bring that resolution closer to actually being manifested. 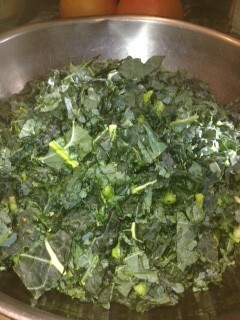 As in this yummy kale salad. It started as a thought that this is what I wanted to make for dinner. Then I went out, got the kale and then proceeded through the steps needed to manifest this yummy and VERY healthy dinner for my beautiful family! Stay tuned tomorrow for making that commitment to your New Years resolution. It is January of the new year, millions of people, almost 40% of Americans, set New Years resolutions. Some statistics state that about 38% of those resolutions are to lose weight. But, very unfortunately, only a very small percentage of people actually achieve their New Years resolutions. There are reasons for this dismal fact. One of those reasons is that for people to lose weight, they need a plan. I HAVE YOUR PLAN! Here is your New Year’s resolution solution! It is written out in my day-by-day detailed program Full Body 30 Day Vegan Cleanse. All you need to do is follow it, it is a blue-print for 30 days of what to eat. What differentiates this vegan cleanse from others is that it is a blue print to follow, of complete meals and lots of time saving tips. That is why this is your New Year’s resolution solution – it is a plan! Your New Years resolution can be attained when you have a plan. Another differentiating factor is Full Body 30 Day Vegan Cleanse has you eating food! Real food every day. Real food every meal! Three meals a day plus optional snacks. You won’t be starving on this Cleanse, you will be eating Very well and very good tasting meals at that! This is one of the reasons people have repeated Full Body 30 Day Vegan Cleanse, it is do -able. And they felt great! The other very important differentiating factor with Full Body 30 Day Vegan Cleanse is the 4 weeks of herbal formulas specifically designed for this cleanse. I developed 4 distinct herbal formulas that will help make healthy differences to your body. I have been a licensed Acupuncturist/Herbalist in Ca for 23 years. I have a lot of experience helping people with herbs. The herbs will help you reach your goals. These herbal formulas are part of the answer to reach your New Year’s resolution solution. Step 1: Be clear on your New Years resolution. If you are clear on your New Year’s resolution, then you can be clear on your plan for your New Year’s resolution solution. Of course, with this time of year, food and drink are a big part of almost every celebration you will attend. It is very possible to stay healthy through this time of year. One of the best things you can do to help yourself is drink a lot of water. I usually tell my patients to drink 3 liters of water/day. It’s a great goal going into the new year. When the weather gets colder and people contract bacterial and viral infections, these are the infections that so easily spread through an office or a family. If you can increase your water intake to 3 liters a day, it will make a very big difference. When you are drinking a lot of water, it continues to flush out your mucous membranes. So, your sinuses, and throat and even your lungs benefit by all that water by making it harder place for bacteria and viruses to live. If your mucous membranes don’t get flushed as much and your diet causes a sticky film to coat them then it is a much easier place for organisms to cling to and breed. And make you sick. You can go through the holidays healthy by making the right choices in taking care of yourself. Full Body 30 Day Vegan Cleanse can help you to make those right choices. We spend billions on anti-aging products. We are spending so much on products to help us retain our youth that it is projected that by 2015 we will have spent more than $291 billion for products to help us in this quest. The Fountain of Youth has been a popular quest for centuries, but we are the first generation to actually have available to us, products and knowledge assisting us in our quest. Its great that our generation wants to continue to feel good and look great. It says a lot about who we are now. It seems that collectively we all want a better quality of life for ourselves for the duration. Clearly we are not willing to settle for the aging process without putting up a good fight- and lots of money! We all want the best anti-aging solution we can get. We get to put up this good fight because there is much more knowledge of how the human body operates and how our foods and our lifestyle effect us. We know more now about taking very good care of ourselves. This then allows us to be in this very new place of being able to take steps toward retaining our youth. There is a lot of progress amongst the human race that has allowed us to come to this place. I think its important to acknowledge that. With so much information out there, what is your best anti-aging solution? Very simply, it is taking very good care of yourself. There is no new and improved way to “take good care of yourself”. It is simply, get good quality sleep, keep stress as low as possible, don’t smoke, exercise 5 times a week, drink at least 8 – 8 ounce glasses of water daily and eat a very healthy diet that is predominately vegetables. Everything you eat has a direct effect in your body. And, since we all have to eat to stay alive, why not eat foods that will help you go through life feeling great and keep your body and brain as youthful as possible. The foods that will keep you healthy are the same foods that will keep you youthful because according to all the studies, it looks like a very healthy diet and exercise will help you avoid the most prevalent chronic diseases. These chronic diseases take their toll on your body, changing the cells, and the organs including the brain. These changes increase aging. Your best anti-aging solution is to eat a diet filled with foods that are are packed with anti-oxidants. Anti-oxidants are what scavenge up the free radicals that create damage to cells. Numerous studies have shown that the people who eat several servings of fruits and vegetables each day, usually have lower prevalence of cancer. It is thought that some cancers develop as a result of free radicals. Free radicals have detrimental effects to the skin, immune system, liver, kidneys, and brain. All of the foods eaten during Full Body Vegan Cleanse are tremendously helpful to your skin, immune system, liver, kidneys and brain. You can learn more about how you can eat a diet rich in anti-oxidant foods. Full Body 30 Day Vegan Cleanse could be your plan for anti-aging. Why? Because all the foods that you will be eating in this program are ONLY helpful to your body. The foods you eat while on this program, All of the foods, are foods that will not produce large amounts of free-radicals. This is because they are natural and easily utilized by your body. Everyone who has done Full Body 30 Day Vegan Cleanse has felt great! Had more energy! Could think with clarity! They noticed their skin looking better, and even had other people notice their skin looking wonderful! Many of the people have also noticed changes to their hair – and got compliments on their hair. This all adds up to the Fountain of Youth – your best anti-aging solution – really, I was almost 50 when we shot that cover photo.